The Department of Physics serves MIT undergraduates in many ways. As a foundational science, two semesters of physics are required of all MIT undergraduate students. The Department takes pride in offering numerous flavors of Physics I and Physics II to accommodate the diverse learning styles of MIT students. We deploy many of our best teachers to work with non-physics majors in these subjects. For those who enjoy physics beyond the Institute requirements, we offer two distinct options leading to a Bachelor of Science in Physics. Those interested in majoring in physics are welcome to explore the curriculum, the activities of the Society of Physics Students, and the opportunities afforded by our faculty and staff. Believing strongly in the value of research for both undergraduate and graduate students, the Department participates with enthusiasm in the UROP program. 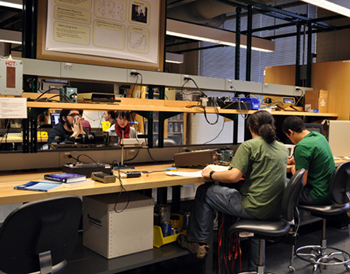 Undergraduate students are encouraged to actively participate in labs and research groups. This gives students the opportunity to learn fundamental skills that will be valuable in a variety of research settings. Information on these topics and more can be found within the Undergraduate Programs web pages on the left. Grad students in "penthouse" of Bldg 26 with their view of the MIT dome. Graduate students in physics are actively engaged in research at the forefront of physics, in collaboration with faculty who are acknowledged leaders in their respective fields. Learning takes place in both formal and informal settings with a broad spectrum of colleagues, including faculty members, postdoctoral fellows, research scientists, and graduate student peers. Most graduate students are interested in one or a few sub-fields in physics at the time they arrive at MIT. Students may narrow their focus, or change their sub-field, as they begin their research. The Department encourages this student flexibility with modest course requirements and ample faculty advising resources. Information on these topics and more can be found within the Graduate Programs web pages on the left.